easyPDF Cloud works with Dropbox, allowing you to convert and configure documents in your Dropbox folder. This integration just got a lot better. We’re proud to introduce the Folder Monitor feature! Now you can convert your files simply by dropping them into a Dropbox folder. 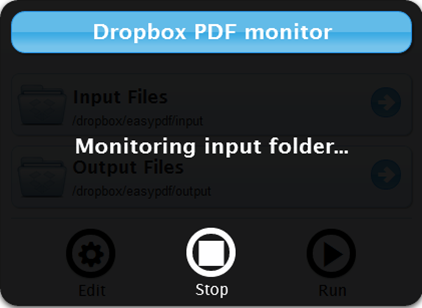 Setting up Dropbox Folder Monitoring is easy (Watch the Video). First, create a conversion workflow with Dropbox input and just turn the “Monitor this folder for new files every 5 minutes” button to Yes. … from that point on, any file you place in specified Dropbox input folder will go through the workflow and appear in the specified output folder (Watch the Video). Sending someone a PDF document when you have Word, Excel, Powerpoint or even a webpage, is as simple as dropping the file into your dropbox folder. You don’t have to be on easyPDF Cloud, you don’t have to manually Run the workflow; you just have to drag and drop files to your Dropbox folder. Try it out and let us know what you think! As always, we look forward to hearing from you. 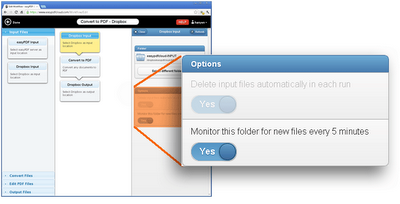 Click here for the complete list of easyPDF Cloud features.